A good remodel improves your kitchen’s functionality and provides great relief from an outdated style. We caught up with two local experts who share their insights into the process of kitchen remodeling and the latest trends. This pretty kitchen features Dura Supreme cabinetry, sold locally through Benson Stone Co.
That’s the comment Diane Feuillerat hears most often after she renovates a customer’s kitchen – and she’s overseen well over 1,000 remodels in the Rockford region. These days, kitchen updates often include removing a wall or two. “People just love the more open, airy feeling and cooks really appreciate being a part of what else is happening in the house,” says Feuillerat. An up-to-date kitchen not only works and looks better, but also makes a house more attractive to buyers. And as home improvements go, it’s the one that brings the best return on investment. “In the right neighborhood, the return on investment of a kitchen remodel is typically 60 to 80 percent,” says Feuillerat. So, what holds people back from giving their kitchens the attention they need? Feuillerat walks customers through a foolproof process she’s used successfully for 30 years. “You know how much a car costs. But it’s much less clear what a kitchen renovation will cost until you do some homework,” she says. New cabinets and countertops will comprise about half the price tag, and this varies greatly depending on the quality you choose. Other costs include labor and, depending on the design plan, carpentry, plumbing and electrical work, plus products like flooring, paint, hardware, backsplash tile and lighting fixtures. “Next, we ask you to go to our website and visit our store to look at displays and learn what you’re drawn toward,” she says. Along with her kitchen functionality expertise, Feuillerat offers the assistance of Tami Blevins, her interior design expert, who can help to guide the aesthetic decisions that make a dream kitchen so rewarding. Customers hire their own contractor or work with one Feuillerat recommends. Cabinets take five to six weeks to arrive. Feuillerat sells various price point lines of cabinetry in the Grabill and Holiday brands. She’s dealt with both brands for many years and deems them dependable and up to her standards. “These days, there are endless options for materials, door styles, stain and paint colors, mullion glass door inserts and more,” she says. Likewise, a wide selection of countertop materials exists today, including quartz and granite, which remain most popular. Measurements for these must be absolutely precise, and Feuillerat is a stickler for detail, as are the contractors she recommends. The contractor and any needed subcontractors come to the customer’s home about two weeks before installation to do prep work like removing old cabinets, opening up walls and moving or installing plumbing or electric as needed. New flooring may be installed before or after cabinet installation, depending upon the situation. Feuillerat helps customers to mentally prepare for it. By the time the final touches are put on your brand-new kitchen, you won’t regret a few weeks of inconvenience, she says. “That’s when I nearly always hear this comment from thrilled customers: ‘Why didn’t we do this a long time ago so we could have been enjoying it?’” she says. So, you finally took the leap and now you have an updated, beautiful dream kitchen. How long will it remain up-to-date? There’s one trend that Hauch predicts will be in demand for a long time: cleaner lines and low-maintenance materials. A rise in the popularity of quartz countertops is compatible with this trend. “They’re super-durable, easy to clean and won’t stain like marble can, but they’re also beautiful,” says Hauch. Quartz countertops are made of man-made composite materials and are extremely durable and highly stain resistant. Granite countertops also are very durable and loved for their natural beauty. “Each slab of stone is entirely unique, and people love that about granite,” says Hauch. Shades of gray remain popular for painted cabinets, as do gray-brown stains. “Color trends usually last about 10 years, and the gray trend began about five years ago,” Hauch says. Today’s grays have evolved to softer, more fawn-colored shades. Very dark cabinet stains are less requested than before; white-painted cabinets remain timeless. While reddish wood hues are out of style, cherry wood, as a species, is in demand. When choosing cabinets, buy the best quality you can afford, recommends Hauch. Among the brands carried by Benson Stone Co. are Plato Woodwork, Ultracraft, Quality, Woodharbor and Dura Supreme. Benson Stone Co. carries several lines and price points of cabinetry. Customers are often surprised to learn how competitive the store’s pricing is, says Hauch. “Even our lowest-price point cabinetry is far superior in quality to what you would find at a big-box store,” she adds. Along with easy maintenance, there’s another trend that’s likely here to stay. More-convenient storage styles, like deep drawers, blind-corner cabinets with swing-out drawers, roll-out pantry shelves and easy-lift platforms for heavy items, make good sense. Roll-out wastebaskets and recycling bins are nearly standard in the kitchens Hauch designs. “Everyone wants them,” she says. The same is true for soft-close door and drawer closures. Kitchen islands continue to replace kitchen peninsulas, says Hauch. They’re versatile workhorses that often allow for better traffic flow. 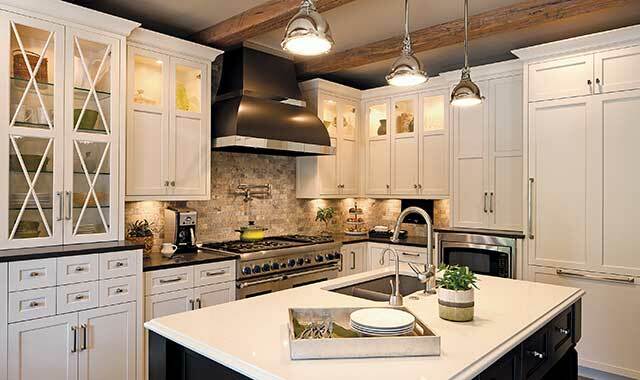 Lighting is another important factor in any kitchen renovation and shouldn’t be ignored. Correct lighting makes the kitchen more functional and more beautiful, says Hauch. Benson Stone customers have the advantage of one-stop shopping, since the store offers cabinets, countertops, flooring, backsplash materials and a full-service lighting center all under one roof, along with professional designers who can make your remodeling journey easier. This entry was posted on Thursday, June 8th, 2017 at 11:59 am	and is filed under Home & Garden. You can follow any responses to this entry through the RSS 2.0 feed. Both comments and pings are currently closed.